Because we are a small business, open for only six months a year, and there is high demand for our accommodations, we enforce a strict policy for deposits, cancellations, and no-shows. 1. At the time of reservation, we take a deposit of the first day’s reservation. The balance of the payment is charged 15 days before arrival. Note: If the reservation is made less than 15 days before arrival, the full amount of the stay will be charged at time of reservation. 2. If you cancel more than 30 days prior to arrival, we will refund the full deposit amount (less any 3rd-party charges that may apply). 3. For a cancellation between 16-30 days prior to arrival, we will refund half the deposit amount (less any 3rd-party charges that may apply). 4. For cancellations 15 days or less before arrival, you are responsible for the entire amount of your reservation and your card will be charged for the full stay. NOTE: There are no refunds for early departures, partial stays,weather, health, or any other circumstances. It is not possible to drive directly up to the rooms or our lodge buildings – because we are across a small river! Limited parking is available about 250 meters from the lodge, and requires walking across a hanging bridge and an open field. Please park only in the indicated area (not on the beach or too close to the bridge.) In high season, if the parking area is full, it will be necessary to park on the side of the main road. = There are no kitchen facilities for guests to cook or to store food at the lodge or in rooms. Check in is usually between 2 p.m.–8 p.m. the day of arrival. Please let us know if you think you may arrive earlier or later. Check out is before 11 a.m. on the last day. Breakfast is served at 9 a.m. in the common dining room. Quiet hours are from 10:30 p.m. to 7:30 a.m. Please help us maintain the quality of our rooms for all guests to enjoy: NO smoking, cooking, or boots/shoes inside rooms. By reserving a stay with Campo Aventura, you (and all members in your group) fully assume all risk of illness,injury, death, or loss or damage to my property and hereby release anddischarge Campo Aventura, its owners, and its employees, from all actions, claims or demands for damages resulting from my participation in a stay or program activity. Pet Policy: NO PETS in any rooms or on the premises at all. Smoking Policy: We are a non-smoking facility in doors. Smoking in a room will result in a $150 cleaning fee. You may smoke out of doors, at an appropriate distance from other guests. Lost Items Policy: We are not responsible for items lost or stolen during you stay with us. We ask you to please make sure your valuables are secure. Damage Policy: By making and paying for a reservation, you--including everyone in your party--take full responsibility for any damages to the room or property and for any related costs. repairs before I leave. I will report any damages that occur. Any illegal activity on our property is prohibited—including, but not limited to the use of illegal drugs and other substances. If this happens, you will be asked to leave the property immediately,will forfeit the remainder of your reservation, and will receive no refund. BIENVENIDOS! Welcome to Campo Aventura's Riverside B&B in Cochamó. 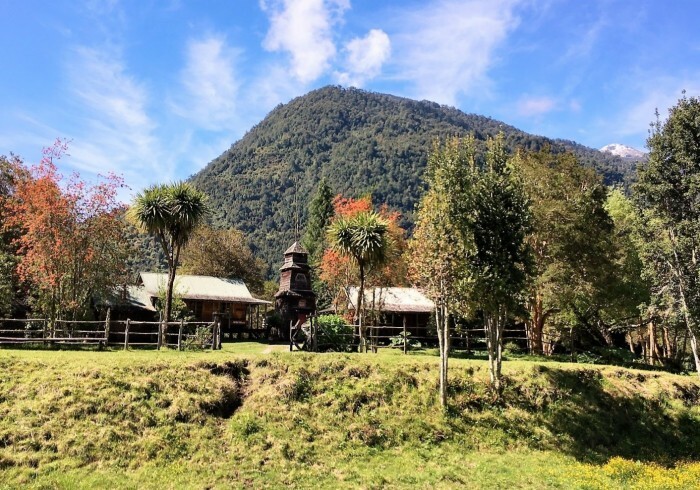 Riverside Bed & Breakfast is the Cochamó Valley’s first and original wilderness lodge, built more than 25 years ago—when there was no paved road, no bridge across the river, and no electricity! Happily, for our visitors today, we have these conveniences—so you can easily get to Riverside and enjoy stunning views, tranquility, and a taste of traditional northern Patagonia hospitality and culture. We are right at the entrance into this beautiful rainforest river valley, where the Rio Cochamó flows out into Chile’s northernmost fjord, the Estuario Reloncaví. = From our lodge, you can walk along the river. = Or venture along the estuary to the village. = Or, for the more adventurous, take a short drive to the trailhead and hike into the dense rainforest toward the soaring granite peaks of La Junta, along the Cochamó Trail—the same trail that Butch and Sundance once rode! We have only four accommodations – a double room and two twins in the front, and a separate two-room family suite– so you are assured of individualized attention. A delicious breakfast, with home-baked items, is served in our high-roofed dining room every morning. And you are free to relax in our community fogón—read a book, play cards, or chat by the wood stove. You will be welcomed by Mike, our manager, who can recommend activities and local restaurants and share as much information about the area as you need. Ana, our chef and housekeeper extraordinaire, will make sure you are comfortable and well fed. You may also get to meet huasos Horacio and Pancho, who work with our horses (and at our second Mountain Lodge property in the upper La Junta valley). We can't wait to share our beautiful valley with you! Are you interested in CAMPING instead? We have camping space available at Riverside Lodge as well as a large campsite at our Mountain Lodge La Junta. Just email us for more information -- info@campo-aventura.com.